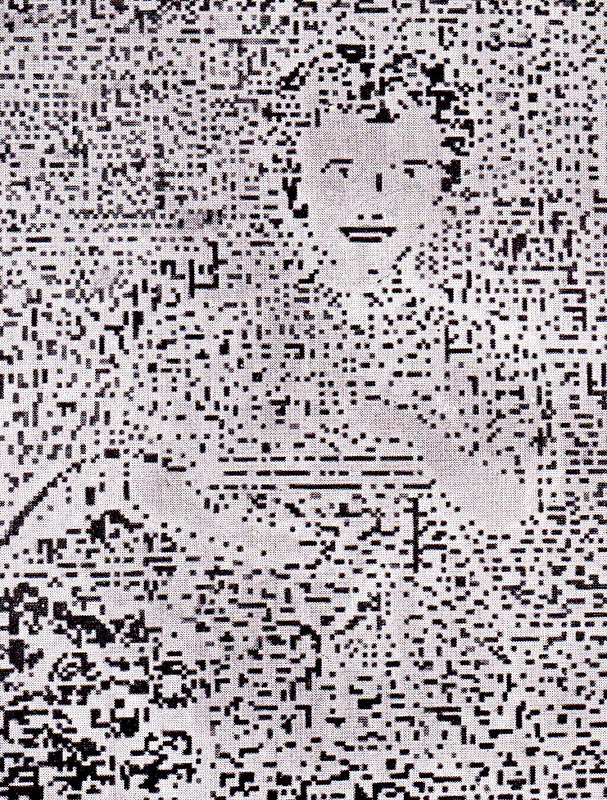 One of the first digitized image, by Albert Ducrocq (1953). Last revised 9/2/2014. Return to Major concepts. See art, fragmentation. We work mainly here on an abstract presentation of the concept. For its development along centuries, see history. The digital became a realty with the advent of the electronic computer in the 1940's. It was the result of long process of fragmentation going along with new technologies (mechanics, chemistry, electricity, electronics, biology). We can see the digital universe as a world of billions of "beings", more and more connected in the "cloud" (See our text Digital Art, from the Bit to the Cloud (2014). We will elude here the philosophical issue of human transcendance with regard to machines, but note that living beings are partly digital (DNA) and that a lot of issues can be dealt with without negating the possiblity of immaterial beings, noting in particular that "conscience" remains, at least, an open issue. - A tentative definition of digitization: atomization of the relation between idea and matter. Here, the unbreakable atom is the bit. It is neither material nor spiritual. Its existence calls for both a material substrate and an idea (or intention). - Digital is associated to logic, and to discrete, in opposition to analog. - Everything is more or less digital. In arts more than elsewhere. - A minima, a work can be called digital if its creation uses the computer at any moment (from design to distribution). That is de facto the case for every work of art today. - See [Adams]. [Bres] has several pages dedicated to binary images. - Binary coding is the extreme, atomic limit of digitization. - What matters in digital art? The (digital) soul! by Pierre Berger. Communication at Laval Virtual 2011. Online. - Digital Deli. by Steve Ditlea et al. Workman publishing, 1984. - Diverse notes, to be edited.